Welcome to Night Vale is one of my favorite podcasts. The Voice of Night Vale, Cecil Palmer, hosts a radio program informing the local residents of events like the annual marathon Through the Narrow Place, PSAs like the dog park is not a place for people or dogs, and news like an attempted takeover of the town by a five headed dragon. Just small town stuff. I like the podcast because it's quirky and weird. It creates a world where the laws of nature don't apply, yet there is a strange logic that makes sense within that world. I've become attached to the recurring characters who appear on the show: the Faceless Old Woman Who Secretly Lives in Your Home, Old Woman Josie and her angels, and the revolving door of interns who meet untimely deaths. These are fixtures of the show now. 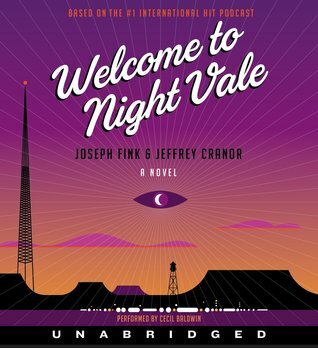 I was really looking forward to more of this in the first Welcome to Night Vale novel, written by the creators of the show, Joseph Fink and Jeffrey Cranor. I knew I would have to listen to the audio version of it, especially since it is narrated by Cecil. Unfortunately, I think I had built it up too high in my mind. The book focuses on ordinary people living in Night Vale. Diane Crayton is a single mom with a teenaged son who constantly changes physical form. Jackie Fierro is the owner of the pawn shop who has been nineteen years old for decades, maybe centuries. Diane keeps seeing her son's estranged father, Troy, everywhere, apparently the same age as the day he left. Jackie receives a paper with the words "King City" written on it that she can't throw away. Both women are forced to work together to solve their individual problems. All roads lead to King City, even though it is impossible to get there. I guess the book is a look at what is happening to regular people while Cecil is reporting the weird news. I'm not sure I really like it. I enjoy thinking of the residents as a collective. It would be a bummer to focus on all the people lost during "Street Cleaning Day." Some of the best parts of the book were the Voice of Night Vale sections, snippets of Cecil's radio broadcast, and are in the spirit of the podcast. The pacing of the story is slow, especially at the beginning of the novel, I kept waiting for something to happen. In a town like Night Vale, there should be a lot of things happening! Instead, lots of thinking from the characters. And repetitive sentences too. This was a disappointment for me. I wanted to love it, but... I will be sticking with the podcast because I think that is really the format for this kind of storytelling. About the Audio: Cecil Baldwin narrates the novel, with appearances by Retta and Dylan Marron. Cecil is Cecil. There could be no one else to narrate Welcome to Night Vale. Maybe this isn't fair because the podcast is so well produced and I don't know anything about audiobook production but I didn't find the quality of sound to be as good. Yeah, I have no inclination to read the book. I think Night Vale works just beautifully as a podcast, and I am happy with it in that one single format. Branching out, not always necessary! HA see but, inspired by you, I listened to a Welcome to Night Vale podcast at work today, and it was swell. Yes, and they have their store and the live shows. The book is just an extension that didn't work for me. Aw, sorry you were disappointed. Interesting... I too love the podcast and have been wanting to read the book for some time. What I would really like to do it attend one of their tours around the country. They haven't come to my city yet but hopefully soon. Not much chance of me seeing their live show. I'd like to though. I love the podcast and have been eyeing the book so it's a bummer to read what it's really about. I don't know that I want to read any kind of ordinariness in the book! I love the weird stuff in Night Vale better. I think I like focusing on Night Vale through the radio program. That's how I want to see the people of Night Vale. I haven't read this but was just excited about a new format for Night Vale without really thinking about the fact that I'm pretty happy with the format we have and like you said, I don't really want to get more details into the residents of Night Vale. At least, not unless it's through Cecil's bulletins and whatnot. We know that the people are weird through him. I'd like to keep it that way. I enjoyed the book, as an experimental form of of storytelling in that same world. Yes, it's a bit different than the "podcast" layout, but I had fun imagining a wider circle of weirdness. I think listeners to the podcast will notice the hints to known characters and plotlines. (I can't comment on the audio version as I read a paperback). I noticed some hints in the recent podcasts that made more sense now. I learned that another favorite podcast, Lore, is about to become a tv show. I'm exciting for them but I hope that format works for me.